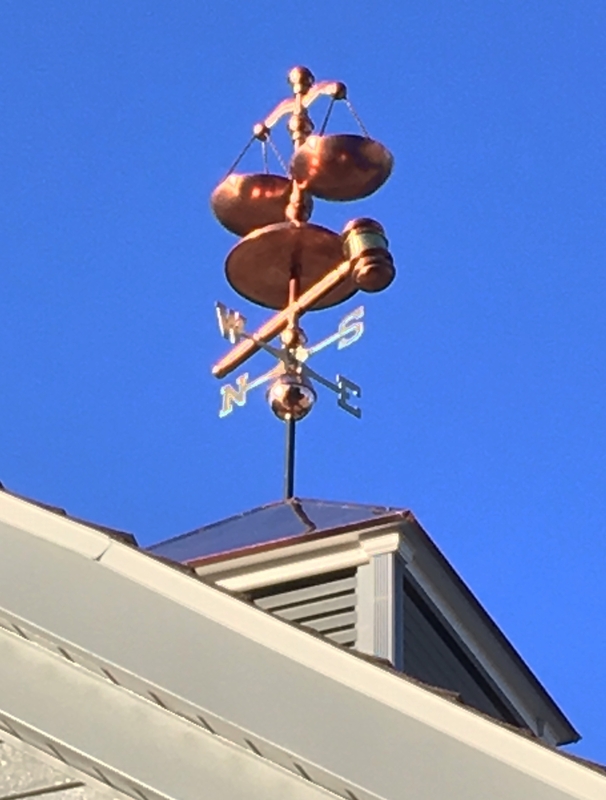 This Scales of Justice Weather Vane is our most recent 3D creation. The client who commissioned this piece wanted to have the scales in ‘scale’ and we liked that idea. 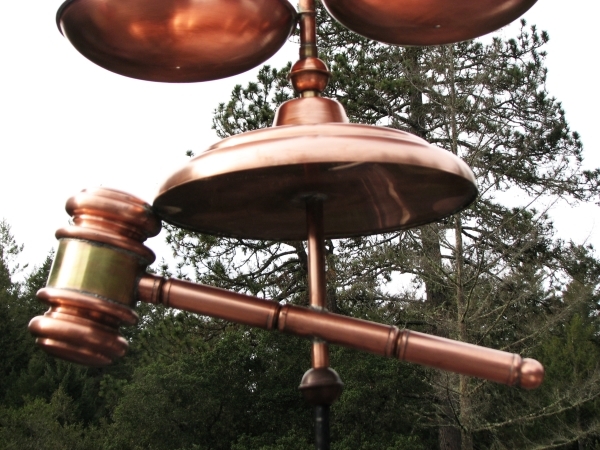 The sculpture is created of copper with brass accents on the gavel. 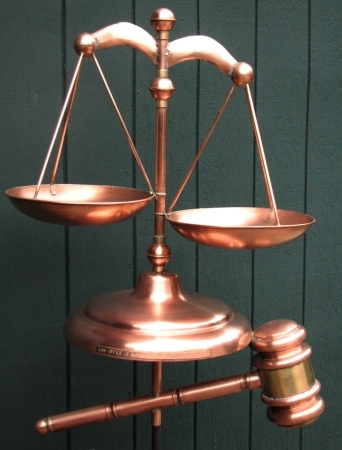 The gavel, scale base, and bowls are all of spun copper. This three dimensional vane would also look grand with optional gold or palladium leafing. 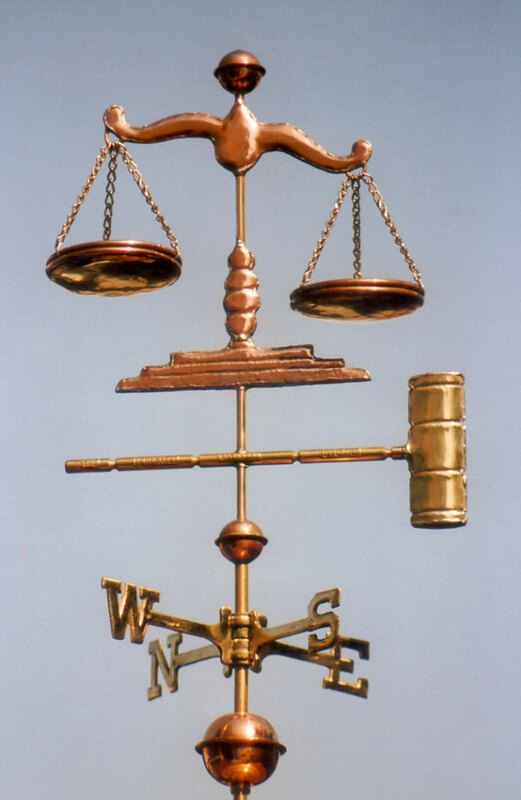 Our first Scales of Justice Weather Vane was made many years ago. It was commissioned as a gift for a judge who was celebrating her 50th birthday. On the handle of the gavel we stamped her name and title. In the upper of the two scales we put a ‘lucky’ penny from the year she was born and in the lower scale, we put a ‘lucky’ penny from the year she was celebrating her 50th birthday, symbolically indicating the gravitas that comes with age. 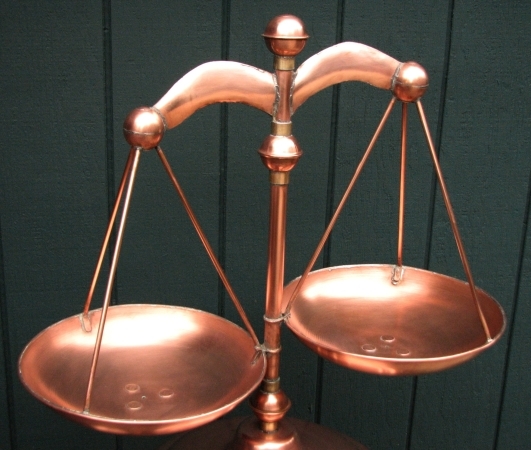 For that original version, pictured below, the scale is in copper swell bodied style with brass chains, and the gavel is brass. While this weathervane can be made entirely in copper, adding brass to the sculpture piece is nice because the North, South, East, West directionals below the sculpture piece are also made of brass. 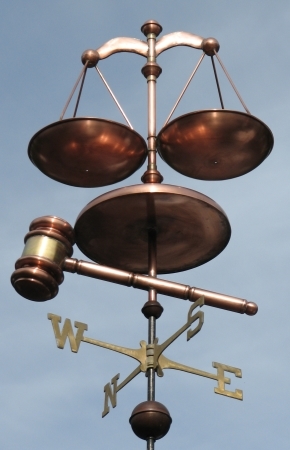 This weathervane was intended for inside a judge’s chambers. For outside installations, we strengthen the chains so they will remain stationary in the wind. In astrology, Libra, also known as “The Scales” or “Balance”, is the only symbol of the zodiac that is represented by an inanimate object, rather than an animal or human. Libra (♎) is the seventh astrological sign in the Zodiac, originating from the constellation of Libra. It corresponds to people whose birth dates are September 23 – October 23. The personification of justice balancing the scales dates back to the Goddess Maat, and later Isis, of ancient Egypt. The Hellenic deity Dike was portrayed carrying scales. Ancient Rome also adopted the image of a female goddess of justice called Justitia. 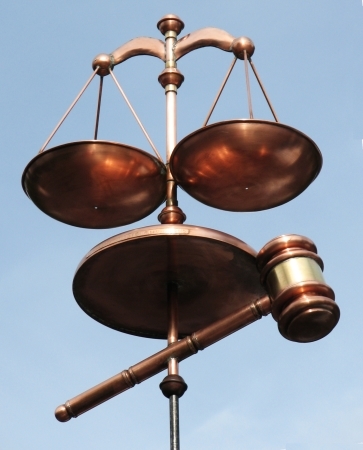 Since Roman times, Justitia has frequently been depicted carrying scales and a sword, and wearing a blindfold. In modern iconography Lady Justice frequently adorns courthouses and courtrooms in the United States. We would love to make a Lady Justice weathervane someday. If anyone is interested in commissioning such a weathervane, I would be willing to the design work gratis, as long as we have permission to reuse the design in the future.